Impress your guests by serving unique and flavorful drinks in a shooter glass. To keep these drinks fresh and protected from airborne contaminants, use the Emi Yoshi EMI-607LP Clear Plastic Shooter Glass Lid 2 oz. Thanks to its tight seal, this premium disposable lid ensures sturdy transport and minimizes spillage. 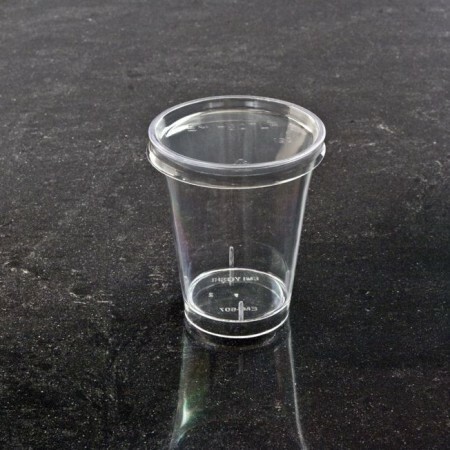 Made from polyethylene terephthalate, this shooter glass lid is break resistant and disposable for quick clean-up. Shooter Glass Lid 2 oz. I have been purchasing a tube or two of your 20 oz. clear plastic tumblers that can be put in a washing machine. The store where I have been getting them says you do not make them any more (they just received an order of other sizes from you, but not the 20 0z.) Is it possible for me to purchase a tube or two of this item directly from you please. I would appreciate hearing from you. Thank you.